No other bloom captures the softness of the early summer season as well as herbaceous paeonies. Long-lived and beautiful at every stage, they will give years of pleasure and by clever selection you can have peonies in flower for 4 to 5 weeks at least, before their sumptuous coppery foliage takes over. It's a complete myth that they cannot be moved. This old wives' tale, which goes back to the 1st century AD, was perpetuated by Pliny the Elder (a Roman naturalist) who was in awe of this powerful cure-all. Blinded by the peony's magical properties, the Ancients didn't want to mistreat them and suffer the consequences - after all they named this plant after Paeon, physician to the Gods. It's important to select good varieties and many of you will know the May-flowering cottage garden peonies (forms of Paeonia officinalis), which had fleeting flowers that dropped their petals within days, fading as they did so. Avoid these 'short timers' and opt for those listed under instead. These will give you 3 weeks of flower at the very least and there are early, mid- and late varieties. Any single-flowered forms will perform early and tolerate more shade. 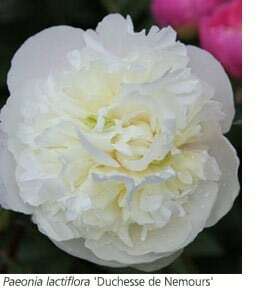 Paeonia lactiflora is a fragrant Chinese species, which was introduced into Europe towards the end of the 18th century. French nurserymen, who supplied many cut flowers to the grand houses in Paris, saw the potential immediately and began breeding. For this reason many of our best peonies have French names that date from 150 years ago. These veterans still lead the field especially when it comes to soft pinks, creamy whites and deeper pinks. The fact they have survived for so long demonstrates their durability and garden worthiness. No garden should be complete without the lemon-scented, pale cream 'Duchesse de Nemours' bred by Calot in 1856. The globular flowers have a hint of yellow, which softens them in the garden setting. The foliage is greener than most too. It must be one of the top three herbaceous peonies in the world. 'Festiva Maxima' (Miellez 1851) is also among the elite, with buds that open pale pink and then suffuse to creamy white whilst showing a red flash, which varies in intensity from year to year. It is also fragrant and very strong stemmed. These heavy-headed peonies shrug off summer rain well as they have evolved in China (and Japan) where summer rainfall comes in heavy bursts. When the flowers are fully out, they will swoon when wet so strong plant supports are advisable, or use canes and string. Both should be in place by the time the stems have reached 30cm in height. 'Sarah Bernhardt' (Lemoine 1906) is a fully double apple-blossom pink, but this is one peony that must be staked to prevent the flowers from flopping. It is weak-stemmed, although still widely grown and admired. If you like your peonies less full and heavy as the Japanese do, 'Monsieur Jules Elie' (Crousse 1888) has a rose-pink cup full of divided petals in the same rose-pink. 'Bowl of Beauty', a Dutch variety bred by Hoogendoorn in 1949, has a fuchsia-pink cup filled with creamy narrow petals inside. 'Shirley Temple' (breeder unknown) is a full blush-white which hovers between the full French doubles and the petal-filled cups. American breeders preferred stronger colours than the traditional French pinks and creams. 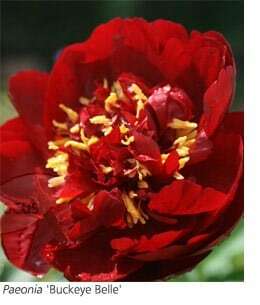 In order to get a deep red they hybridised the earlier flowering cottage garden peony - P. officinalis. The very best of all is 'Buckeye Belle' (bred by Walter Mains of Ohio in 1956). It flowers 2 weeks earlier than the lactiflora hybrids, thus helping to extend the peony season. The semi-double red flowers have a hint of black, which makes the golden boss of stamens shine as they nestle in the mahogany-red inner petals. 'Buckeye Belle' sprang to fame at Chelsea in 2009 when Luciano Giubbilei used it in his iconic Laurent - Perrier Garden, built by Crocus. His combination with smokey fennel (Foeniculum vulgare 'Giant Bronze') works well in the garden. A slow fuse plant, 'Buckeye Belle' won the American Peony Society Gold Medal 2010 and the Award of Landscape Merit 2009. 'Coral Charm' (Wissing 1964), another American breeding breakthrough, is a glowing sunset-orange to peach. It was bred using a red from of P. peregrina named 'Otto Froebel' and it doesn't sit happily with traditional pink, cream, red and deep-pink peonies. It likes a warmer situation as well and could be planted with blues such as Nepeta 'Six Hills Giant' or with a swirl of the fine-tined, honey-coloured sedge Carex testacea. Peonies mingle well with roses because both share the same copper-red foliage early in the year. The scented, lily-flowered tulip 'Ballerina' is a wonderful addition to rose and peony borders. The warm-orange flowers of this very popular tulip appear in late-April when the rose and peony foliage is young and vibrant. The bluest rose of all, 'Rhapsody in Blue', is divine set against the reddish pink peony 'Karl Rosenfield', especially when blended with Nepeta 'Six Hills Giant'. Other healthy rose partners could include the pale-pink 'Bonica'. It is one of the best roses on poorer soils and it will only reach just over 3' (up to 1m) in height. Rose of the Year 2013, 'You're Beautiful', is neat and bushy with stunning sugar-pink flowers, or you could grow the pillar rose 'Aloha' on a tripod. This full-petalled rose has salmon-pink overtones, which pick out the bronzed leaves perfectly and it will flush throughout summer and autumn. The time to move peonies is October, when dormancy is just beginning. The secret of success is to replant the plump tubers a mere 5 cm below the soil. Go any deeper and they will sulk forever. You can also divide peonies in October, although larger clumps can bear up to 40 flowers when left alone. Division isn't a necessity, although it will give you extra plants. These very hardy perennials thrive on cold winters and do best in fertile soil that retains moisture. 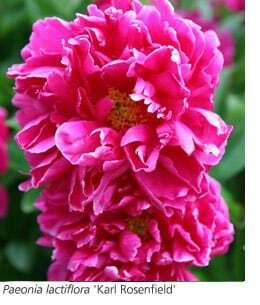 They also benefit from a feed and the pelleted form of Vitax Q4 (applied in April on damp soil if possible), is excellent for peonies and many other plants. If you garden on lighter ground, add organic matter such as well-rotted compost when planting. Mulch the damp soil with bark straight after feeding, but never mulch dry soil. Like all tuberous plants, peonies hate heavy or waterlogged soil in winter. Cut off the stems as they fade in autumn and, if you see a wilted leaf or two at any time, snip it off. Peonies prefer bright light. Wait for the foliage to die back in the autumn before dividing large clumps. Lift the plant and using a clean, sharp knife slice through the roots, making sure that each section of crown has at least 4 or 5 dormant buds. It may be easier to work with the plant after it has been removed from the ground for a couple of hours. Dust the cuts with a fungicidal powder and plant the divisions with their buds 5cm below the soil surface. There are a couple of diseases that may affect your peonies but the most common is a fungal disease called peony blight. This causes the top growth to turn dark brown and wilt and is usually more prevalent during wet weather. It can easily be controlled by using a suitable fungicide, or by making sure that any affected growth is cut away immediately and dead foliage is removed in autumn.